It's 2019, technology is constantly developing and customer's expectations are rising. They expect so much from websites and don't have much time to spare for ones that don't impress them. So as a business owner it is crucial to keep your website updated and to keep adapting the design to appeal to your customers. 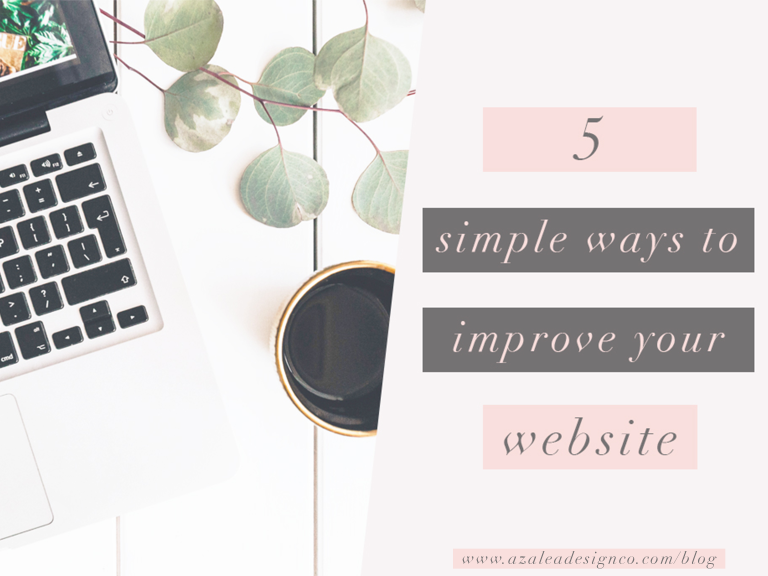 So without further ado, I am sharing five simple ways that you can improve your website so that users stick around for longer time periods and keep coming back! One of the biggest reasons why most users leave a site is because it takes too long to load. And by 'too long', I mean that, 53% of website visits are abandoned if a mobile site takes longer than THREE seconds to load. So that is why it is super important to ensure that your site is running as quickly as possible so that you have more chance of converting those views into sales. The best way of optimising your site is by compressing your image sizes. Keep the quality high but use the minimum sizes to allow for a faster loading time. Call to Actions should be woven throughout the entirety of your website as this provides a clear path for users to navigate through your site. By having clear calls to action that clearly state what you would like the viewer to do next is essential for an easy to navigate website that users love! As the saying goes, a picture speaks a thousand words. Having beautiful, high quality images are going to completely transform your website. If you don't have any images yourself or haven't hired a professional photographer, then I definitely recommend using Stock Images (some are FREE!) The quality of the images you use on your website clearly reflects your business and using highly pixelated or even blurry images is a definite no-no! I think people underestimate how important it is to utilise the white space in your website design. Sometimes websites can feel a little bit full on when there is too much information, that it can be too confusing for your users. White space looks clean, simplistic and modern. Top websites like Google, IKEA and Apple use so much white space that the user focuses more on the content and images. Why not try to add some in your website? Trust me, your users will definitely thank you for it. Sometimes simplicity is best. Last but certainly not least, your SEO. Search Engine Optimisation is key for customers to find your website when searching on search engines, like Google. If this is not up to scratch, then it doesn't matter how pretty your website is, no one will be able to see it. It may even be valuable to keep your SEO updated as you continue your business journey as you may be changing your niche or adding new services. The best way to optimise your SEO is by searching for keywords that link with your business category and niche. Then it may even be worth being in your customers' shoes and think about what they would type into Google to find you. Being specific is ideal! Think about the category of your business, your niche, what you offer and where you are located. After completing all of the above steps to improve your website so that it is more user friendly, sit back and watch those traffic numbers and visiting times creep up! Take advantage of our offer this January. 20% OFF our custom website design package.